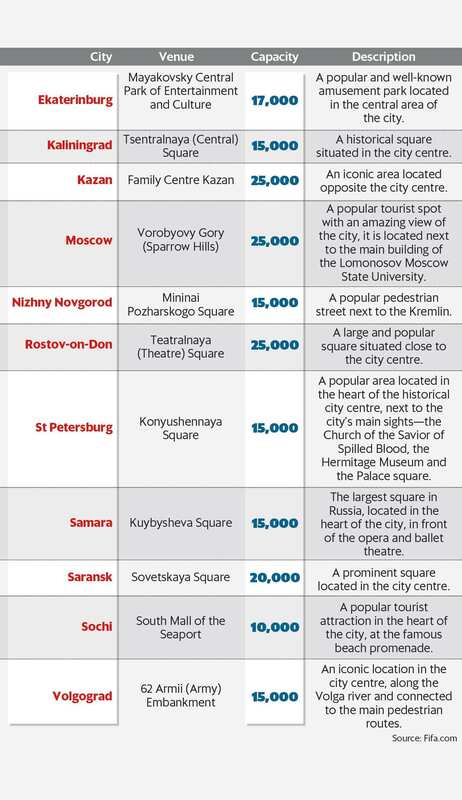 If you are in Russia during the World Cup, the best way to experience the excitement outside of the stadium is at a Fan Fest venue. Fan Fests officially started at the 2006 Fifa World Cup in Germany, attracting thousands of fans for public screenings of the games. These are usually held at popular tourist locations in World Cup host cities, with giant LED screens broadcasting matches live at venues large enough to accommodate thousands. Entry is free, and there are music and entertainment acts before and after. Often, there are celebrity appearances arranged by sponsors, or other fan activities with cool giveaways. But the biggest reason to watch a match at a Fan Fest venue is to soak in the electric atmosphere while rubbing shoulders with football fans from around the world. I discovered my first Fan Fest by accident. I had travelled to South Africa for the 2010 World Cup and had tickets for two quarter-final games in Johannesburg. Before that, I was spending a week in Cape Town, staying in the apartment of a friend who was travelling. It was a great opportunity to explore the city, but I worried that I’d have to watch the matches alone in front of a television in an empty apartment. I found the solution on my very first day in the city, when I visited Table Top Mountain. Right in front of City Hall, at the foot of the mountain, I spotted lots of World Cup signage outside a venue blaring the tournament anthem. Following a slew of fans in, I found an amazing venue with massive screens, live music acts, food stalls, memorabilia outlets and more. From then on, the Fan Fest became part of my routine for the duration of my stay. Each day, my explorations of Cape Town culminated with a couple of hours of football action and friendly banter with other enthusiasts. The stunning backdrop of Table Top Mountain only made the experience more satisfying. Things went up a notch when football returned to its spiritual home in Brazil in 2014. The Fan Fest at Copacabana Beach was a giant beach party. While matches involving Brazil drew bigger crowds and more vociferous fans, other teams did not lack for support. In particular, I remember the celebration by hundreds of Argentinian fans outside the Fan Fest after their quarter-final victory over Belgium. Matches start at fixed times. Group stage matches begin between 1-9pm local time, with a majority kicking off between 6-9pm. In the second round, three matches start at 5pm local time, one at 6pm, and four at 9pm. When it comes to the quarter finals, one begins at 5pm, another at 6pm, and two at 9pm. Both the semi-finals start at 9pm. The third-place play-off starts at 5pm, and the final at 6pm. Since there are 11 time zones in Russia (ranging from UTC+2 to UTC+12), you could be catching a 9pm match in early afternoon or post-midnight (depending on the city you are in). By and large, summer months in Russia provide for comparatively more amenable weather. For example, Moscow is expected to have temperatures ranging from 10-20 degrees Celsius in June and 12-25 degrees Celsius in July, with some probability of rain. Similarly, St Petersburg will have temperatures ranging from 8-25 degrees Celsius in June and 10-26 degrees Celsius in July, with sporadic showers. However, considering the geographical expanse of the country, you can expect some variation across the host cities. Fan Fests are typically outdoors, so wear comfortable footwear, and dress in layers, keeping local weather in mind. Don’t forget to check the rain forecast. Wearing team colours can help instantly break the ice with strangers supporting the same team. Crowds at fests often number in the thousands, so plan to reach well in advance, giving you time to scope out the amenities and find a good spot. Security measures are usually strict, even at Fan Fests so avoid carrying big bags, umbrellas longer than 25cm when folded, vacuum flasks and water bottles, food and alcohol, selfie sticks, aerosol sprays, etc. Avoid carrying any valuables. If you can’t make it to a fest, hop into a bar, pub or restaurant in a busy part of the city. Most screen the games, and the only challenge is getting there early enough to score a seat. I was in Foz do Iguaçu, which was not a Fan Fest city, on the day of Germany’s semi-final against Brazil during the last World Cup. An hour before kick-off, every bar and restaurant was packed to the limit. Often, neighbourhoods have informal screenings for residents and these can be great fun as well, even if they don’t have the facilities of a Fan Fest. And what if you’re in the middle of nowhere, with no access to any of these options? Most fans find a way. I was on a trip to the Amazon the day of the World Cup 2014 final. With no television access, we ended up travelling 2 hours by boat to a hut that had a small TV and a dish antenna. With 20-odd people from across the world cramped inside, we saw Germany beat Argentina in extra time to take the title. Not the result that I wanted, but definitely one of the most memorable football-watching experiences I have had.